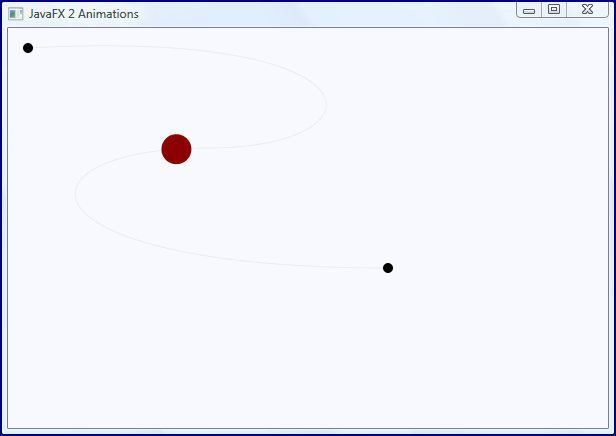 One of the flashiest aspects of JavaFX 2 is its animation support. The insightful Creating Transitions and Timeline Animation in JavaFX covers using both Transitions and Timelines in JavaFX 2. In this blog post, I adapt an example provided in that tutorial to specifically demonstrate Path Transitions. Example 2 ("Path Transition") shown in Creating Transitions and Timeline Animation in JavaFX demonstrates creating a Path with classes from the JavaFX 2 "shapes" package: javafx.scene.shape.Path, javafx.scene.shape.MoveTo, and javafx.scene.shape.CubicCurve. That example then demonstrates instantiation of a javafx.animation.PathTransition and applying an instantiated javafx.scene.shape.Rectangle to move along the created Path. In my code listing below, I've made some slight changes to Example 2 in Creating Transitions and Timeline Animation in JavaFX. I have specifically changed the moving shape from a rectangle to a Circle, added two "end knobs" to the path as two separate circles, and added the ability to change the opacity of the path along with the animated circle moves. The nice side effect of using a zero opacity is that the path itself does not appear and it instead looks like the circle is moving along freely. I tried to break each major piece of this up into its own private method to make it easier to see the "chunks" of functionality. 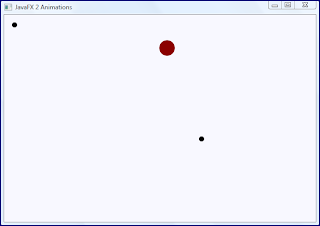 * Simple example demonstrating JavaFX animations. 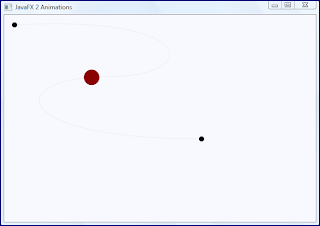 * "Creating Transitions and Timeline Animation in JavaFX"
* @param pathOpacity The opacity of the path representation. * or zero by default if no numeric value provided. * @return Opacity to use for path. * Apply animation, the subject of this class. * @param group Group to which animation is applied. * @throws Exception Exception thrown during application. * Main function for running JavaFX application. 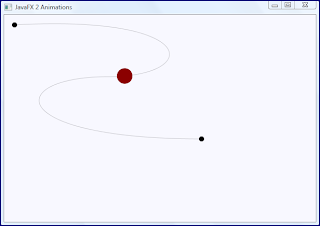 The following series of screen snapshots show this simple JavaFX animation example in action. They are listed in order of descending opacity (from 1.0 to 0.0). Each of the above screen snapshots was taken after running the application with the specified command-line argument (1, 0.2, 0.05, and 0). 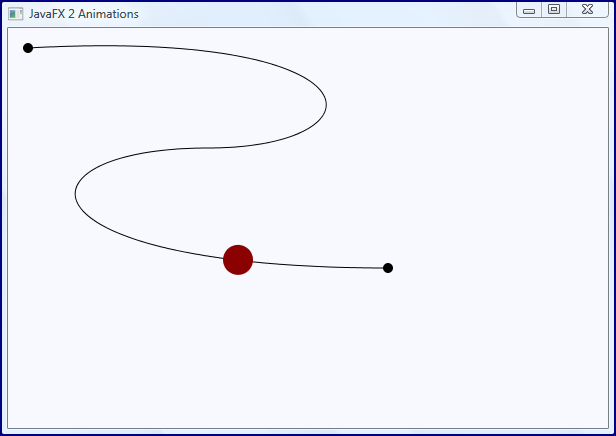 This adapted example has demonstrated using PathTransition to animate a node's movement along the prescribed path (I have blogged on use of Path and some of its alternatives before). Developers can implement their own derivative of Transition and there are other supplied transitions supported as well (such as FadeTransition, ParallelTransition, and SequentialTransition). 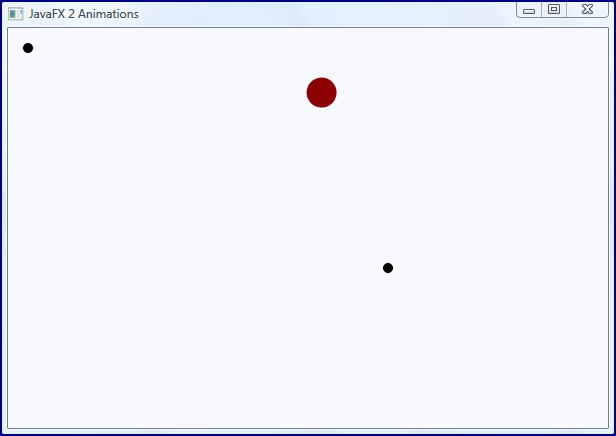 It is a straightforward process to quickly begin applying JavaFX 2 animation using the provided Transition classes.